i have been savouring my nights, reaquainting with my wooldancin' partner in crime "gypsi" - my ashford traveller. We have not danced together for a couple of months due to the move. She sits atop our antique wooden chest, in the center of the lounge room. Each night she is lit with a reddened hue from the leadlight hat stand - a Rather burlesque setting! The thai dancing puppet casts her gaze toward the light shinning on my wheel, & i swear she whispers my name each night after the children are tucked up in the snuggery. 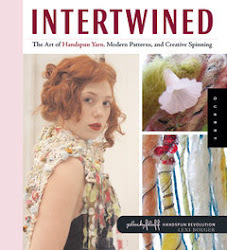 So, with glass of red at hand, i popped this mix of merino x/cotswald locks thru the drum carder, grabbed some camel top & flagrant pink top & yellow curls, & set to boggie. needless to say, the nubbs are having lots of fun appearing in my skeins of late.. relenting to my penchant for texture & fuzz! This one is so nubbly it is destined to become a Coiller i think! 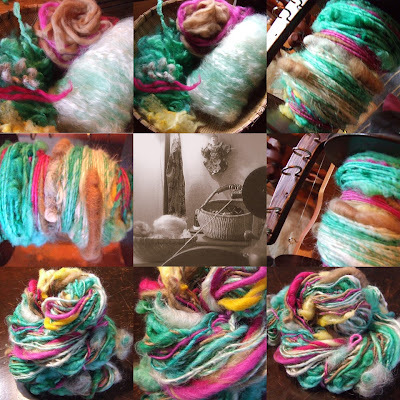 I named this yarn "Nixies" after a children's song called "Nix in the Water" from this delightful cd/book. It is a beautiful circle song/game in which to play with friends. Children form a circle, & Two or three Nixies stand in the center mimicking the actions of the lyrics. The Nixies each run & catch a child in the circle by putting their arms around them. These children are now the new Nixies, & the game starts over.